Gustav Klingert operated one of the most important enamel workshops in Moscow in the late 19th century. Founded in 1865, the firm employed 55 workers until its closure in 1917. 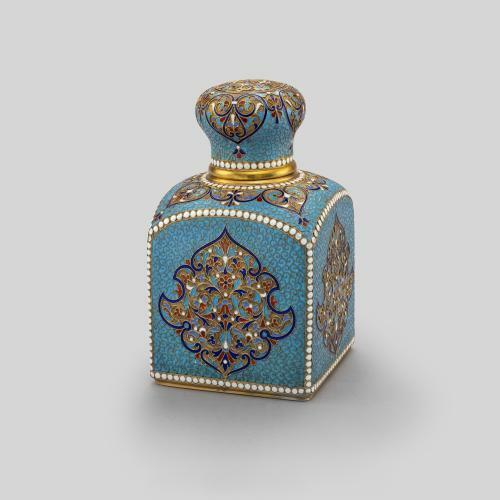 The workshop produced highly decorative and intricate enamel wares such as this tea caddy. Examples of Klingert’s products were shown at a number of international exhibitions, including the Chicago World fair of 1893, and helped to establish the international reputation of Russian enamel work. This caddy is decorated with brilliant opaque colours in the traditional Russian style that was fashionable with the middle and merchant classes during this period, and looked to historic styles within Russian decorative art for inspiration.